Spring is in the air! It’s time to lace you your running shoes, dust off that tennis racket and hit the links. But before you “Spring into Action,” there are a few things you should know to help prevent and treat sports-related injuries. 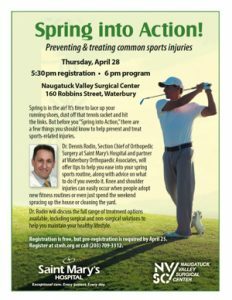 Dr. Dennis Rodin, Section Chief of Orthopedic Surgery at Saint Mary’s Hospital and partner at Waterbury Orthopaedic Associates, will offer tips to help you ease into your spring sports routine, along with advice on what to do if you overdo it. Knee and shoulder injuries can easily occur when people adopt new fitness routines or even just spend the weekend sprucing up the house or cleaning the yard. Dr. Rodin will discuss the full range of treatment options available, including surgical and non-surgical solutions to help you maintain your healthy lifestyle. Registration is free, but pre-registration is required by April 25. Register at the Saint Mary’s Hospital Website or call (203) 709-3312.